I was driving mine around the block a couple months ago. Only the parking brake which kind of worked a little!! But my wife and I had fun doing it!! I replaced all the brake lines, master cylinder and one drum and wheel cylinder, rebuilt the other 3 wheel cylinders, so brakes are as good as they will get until I upgrade to disc or at least to a dual reservoir master cylinder. But I am sure you had as much fun as we did. Scored a full set of rims and 31x10.5x15 tires today. Tires aren't great, but way better than what was on there, and instant 3" lift over the 235/70/15 that were on there. Willard is starting to take shape. 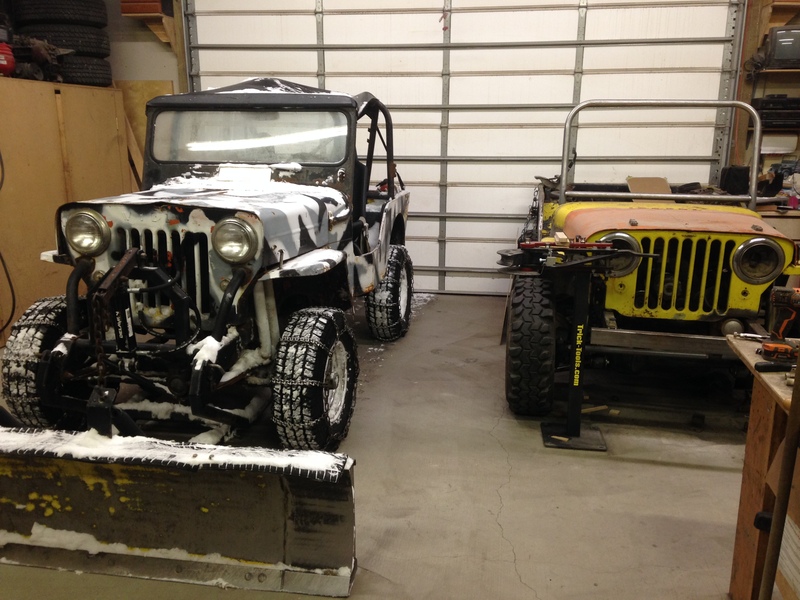 Buildflycrash, 73 cj5, Rich M. and 2 others like this. Brown and white Santa brought my mufflers, exhaust pipe ( how sad is it you can't get a length of pipe at flaps around here? )and a fondly gazed at Mojave Heater. I dropped it all in the 14°garage unceremoniously and retreated back to the wood pellet stove to sulk. CJMark, 3b a runnin, 73 cj5 and 1 other person like this. Installed the new to me soft top. SKT, commanlerwrangdo, 65seejayfive and 5 others like this. Jeep looks good. Looks like a DS drop on the front axle. It’s a grand wagoneer dana 44. Then it started raining and I pulled the tarp back over the project. A professional dinker at work. 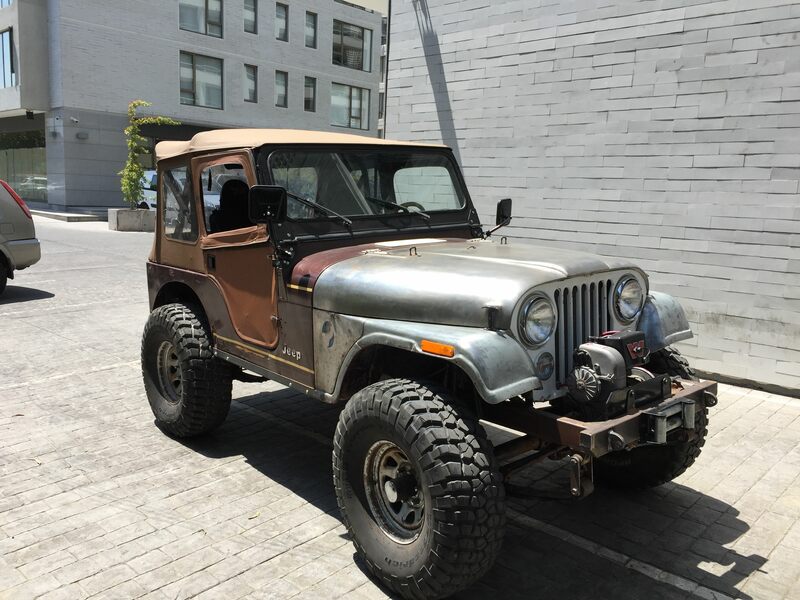 commanlerwrangdo, Fly Navy, 73 cj5 and 2 others like this. I finished making the tie rod and drag link for my steering conversion. Recently got the steering gear and steering shaft / steering column put together. Had to relocate and modify the shock mount in the process. Dphillip, jeepstar, tomasinator and 4 others like this. Adjusted Valve Lash, but made no improvement to tapping noise in engine. I also tightened up the Ross Gearbox to the Frame, turns out (pun intended) both bolts were loose. Id like to do this as well, how hard was it? I got both the rocker arm cover gasket and side engine cover gasket and it seems pretty straightforward, I’ve just never done it before. My rocker arm cover gasket is leaking so I figured while fixing it I may as well check and adjust valve lash! Any tips are appreciated! it was not hard at all. make sure you have a 1 3/8" socket to turn crank over. Mark your plug wires and remove plugs to relieve compression while turning by hand. I used the opposing valve method. I followed this video. I always feel a little tension in the room when I bring the "outside dog" inside from the bitter cold beside the "inside puppy." SKT, Dphillip, commanlerwrangdo and 5 others like this. that thing just looks mean!!! Is that the brake assembly for the varg? 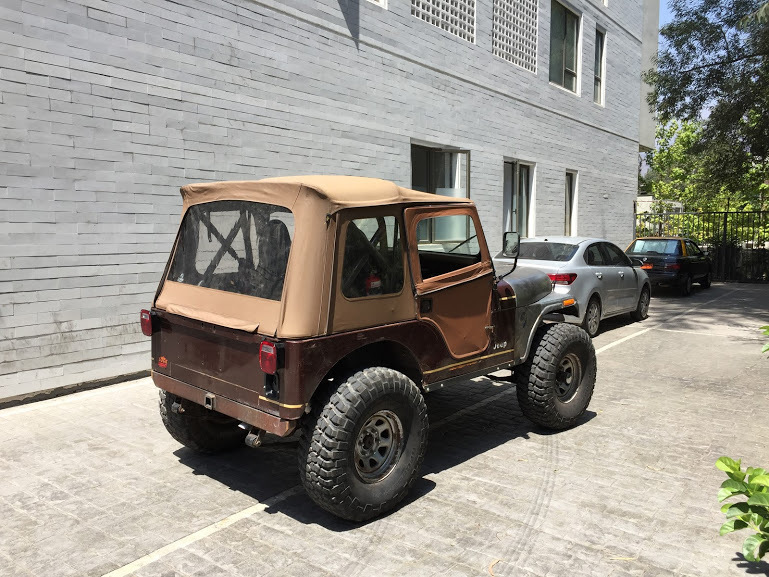 XJ/YJ/CJ? Man, good eye. I had to zoom in on my own pic to see what you were talking about. It's from a Volvo of course. And no, I can't use it. The Varg's pedal assembly has to be totally fabricated from scratch. ojgrsoi, 73 cj5, Bowbender and 1 other person like this.